bepi će polaziti??? : More of the same in Macedonia? 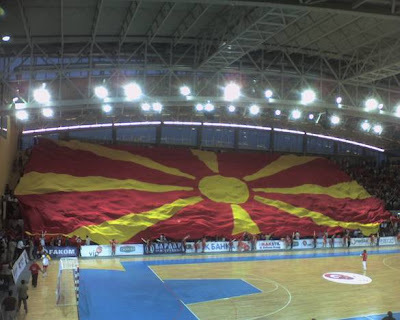 More of the same in Macedonia? Later this year Macedonia is expected to top a plinth it has built in the centre of Skopje, the capital, with a giant equestrian statue of Alexander the Great. The Greeks, who think the Macedonians are stealing their cultural heritage, will fume (although it will at least give George Papandreou's government in Athens a chance to distract attention from the dire state of the economy). Everyone else will assume this is just more Balkan-flavoured craziness. Until then, it looks like more of the same in Macedonia. Sunday’s general election was won by Nikola Gruevski, the prime minister, and his awkwardly named Internal Macedonian Revolutionary Organisation—Democratic Party for Macedonian National Unity (VMRO-DPMNE) party, with 39% of the vote. Unlike the last poll, in 2008, the campaign was not marred by violence (although there was a demonstration in Skopje after the mysterious death of a young man, allegedly at the hands of the police, at a VMRO-DPMNE victory celebration) and the results have been accepted by all the main parties. The opposition Social Democrats (SDSM), led by Branko Crvenkovski, clearly lost, but nonetheless will see its representation in parliament more than double after voters abandoned smaller parties, boosting SDSM's vote share to 33%. A Macedonian general election is really two polls in one. The country's Albanian minority, around 25% of the population, mostly vote for their own parties. On Sunday the Democratic Union for Integration (DUI) held its own against its main rival, the Democratic Party of Albanians (DPA). Theoretically the SDSM could form a government with support from both the Albanian parties, but since they loathe one another even more than they do the main Macedonian parties, this is unlikely to happen. So the outgoing coalition of VMRO-DPMNE with DUI looks set to take the reins once again. The opposition campaigned on claims that the government had failed significantly to dent unemployment—officially 30.9%—curtailed media freedom and flopped on the country’s agenda of joining NATO and the European Union. The media freedom issue focuses on A1, a television channel run by Velija Ramkovski, a well-known tycoon. A1, a pioneer of independent media in Macedonia, had in recent years become a trenchant critic of Mr Gruevski. That, say officials, does not mean it (and Mr Ramkovski) should not pay their taxes. Yet opposition figures see charges of tax evasion as a way of closing down a critical voice. Pro-government media, they say, have not been threatened with closure, as A1 has. As for accession to NATO and the EU, both remain stymied by Macedonia's long-running row with Greece, which says that the ex-Yugoslav state's name implies territorial ambitions over that part of historic Macedonia that lies in Greece. More recently Greece has said it would accept a qualified form of the name, such as "Northern Macedonia" or "Vardar Macedonia" (after the river that runs through the country). Mr Gruevski's re-election means, according to one diplomatic source, “no hope of a breakthrough” on the name issue with Greece. EU and NATO accession will remain stalled, and foreign direct investment negligible. More, then, of the same. Yet the sudden arrest of Ratko Mladic in Serbia on May 26th shows how quickly things can change in the Balkans. Do not rule out a similar turnaround on the name issue. The Greek government is distracted by its economic problems and Mr Gruevski has a fresh, clear mandate. He may yet be able to strike a deal. That is not to say that forcing Macedonia to adjust its name against the wishes of its citizens would be just. But the issue has now held the country back for 20 years. EU officials like to talk of the "regatta principle", by which each country of the western Balkans achieves membership when its individual yacht gracefully sails over the finish line. Macedonia’s problem is that its anchor is dragging on the sea bed.